Gloucestershire hammered Leicestershire at Bristol with yet another century for Kane Williamson and 88 from Benny Howell, who is making Hampshire's decision to release him look more foolish by the day. The pair took Gloucs to a formidable 294-6, and Leics were never in contention after losing Josh Cobb without a run on the board. Graeme McCarter took three wickets and Chris Dent 4-43 as Leics were bowled out for 130. 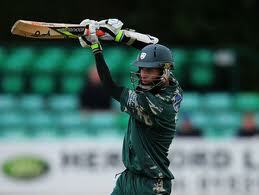 Worcestershire beat Essex comfortably after a good all-round performance from Moeen Ali. He had figures of 8-0-27-1 as Essex were restricted to 190-9 and then hit 99 opening the batting as Worcs won with 37 balls remaing. Somerset again ran Durham close in their one-day encounter at Chester-le-Street. 50s from Gordon Muchall and Will Smith meant that Durham were able to get to 222-9. Jamie Overton took 4-42. Somerset seemed well out of it at 147-8 (Liam Plunkett with 4-33) but Alex Barrow dragged them back into it. He received good support from George Dockrell as the pair put on 58 in 8.2 overs, but with 18 required from eight balls Barrow was dismissed for 75 and the chase was over. There was no result in the game between Scotland and Glamorgan. England's best young all-rounder Chris Woakes made his return and took 2-20 as Warwickshire strolled past Derbyshire. Rikki Clarke also took three wickets as Derbyshire were shot out for 122 and, thanks to 81* from William Porterfield, Warwickshire won by nine wickets. The second hammering of the day came at Hove where Sussex beat the Unicorns by 144 runs. Matt Machan and Ed Joyce both scored centuries as Sussex posted 291-3, a score which the Unicorns only just got over half of. The spinners Michael Yardy and Chris Nash had combined figures of 15-0-49-5 and only a late thrash from Steven Cheetham and Luke Beaven meant that the Unicorns got as much as 147.